In December 2011 TradeCoast Central completed work on what is now the largest facility in the Estate. 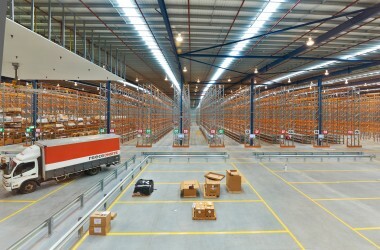 The 26,500m2 Distribution Centre is home to Reece – Australia’s most successful supplier of plumbing and bathroom products. The facility includes a Trade Sales which will open to the public mid- year along with state of the art transport facilities to assist in delivering some of the thousands of stocked products to their 400 stores Australia wide. Reece have spent the first part of the year stocking the extensive warehouse – a huge job by any standard.